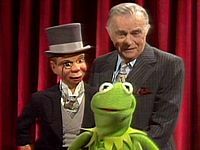 Edgar Bergen had long been an inspiration to Jim Henson. 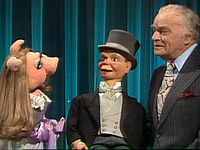 In addition to appearing on The Muppet Show, Edgar Bergen and Charlie McCarthy would put in a cameo in The Muppet Movie...their last filmed appearance before Edgar's passing. The Muppet Movie was dedicated to Bergen's memory and magic. Edgar Bergen is the father of season one guest star, Candice Bergen. Louise Gold starts her regular post-audition gig with The Muppet Show this episode (uncredited - as she would be for all of season two). She can be heard singing in "Consider Yourself". Seven episodes in and this is Fozzie's first comedy spot this year and even then it's a departure from his usual stand-up routine. It's easy to not notice this since so much emphasis has been placed on Fozzie's backstage relationship with others this season or as a more versatile performer (singing with Rich Little and Milton Berle and acting in a sketch with Nancy Walker). 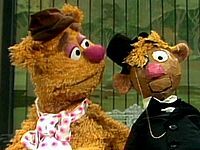 Though Fozzie would continue to be referred to as the show's comedian, it actually becomes rather rare for him to be seen doing stand up comedy in his comedy spot from here on out in the same manner that he typically was in season one. Brian Henson: "Hi, I'm Brian Henson. Everyone remembers the read-through for this particular episode of The Muppet Show. Edgar Bergen entered carrying a little black suitcase and every person in the room knew what was in that suitcase: Charlie McCarthy. Charlie was a legendary character on stage and on radio and then on TV. Frankly he was like a puppet hero to The Muppets. For you real Muppet fans this is the episode where Fozzie tries to be a ventriloquist and Gonzo wrestles a brick. Here it is, The Muppet Show with Edgar Bergen." Charlie McCarthy and Boppity are both amazed at each other. The balcony: Waldorf says, "Maybe this week, they'll be funny." Statler replies, "Wanna bet?" Gonzo's horn: Gonzo is flown backwards from a huge shotgun blast emanating from his trumpet. 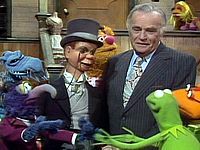 Even though Edgar Bergen and Charlie McCarthy are the scheduled guests, Kermit confides to the audience that they'll try to coax shy country boy Mortimer Snerd into making an appearance and brings on a number to encourage that. T.R. Rooster conducts a flock of chickens singing (or rather clucking) "Baby Face". 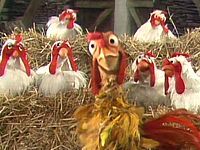 WALDORF: Now why would they have a bunch of chickens singing Baby Face? STATLER: Because the alligators were sick. Kermit and Edgar Bergan try to describe the difference between frogs and toads to Charlie McCarthy. EDGAR: Kermit, do forgive Charlie. I know he can be difficult and trying. CHARLIE: I can be difficult without trying. 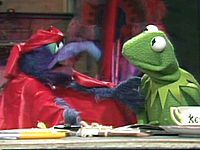 After Charlie breeches some etiquette with inappropriate frog discussions, Kermit retaliates with some wooden jokes and the humor makes the pair feel at home, cueing The Muppets to serenade their guests with "Consider Yourself" and introduces them to some pigs, chickens, and monsters. Gonzo wrestles a brick blindfolded. Even with his keen sense of smell giving him an advantage, the brick wins. Fozzie frantically scrambles for craft supplies to prepare for his act and presents Kermit with a rather crude looking knock-off of Charlie McCarthy which he dubs Chuckie. First Mate Piggy is the only one the rest of the crew deems fit to save them from a major catastrophe; to save the ship, she must operate the independent heating/unifying element across the horizontal equalizing plane. PIGGY: YOU WANT ME TO DO THE LAUNDRY?! 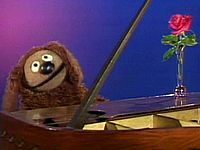 With a rose in vase atop his piano, Rowlf sings his favorite rose song. Fozzie asks Edgar Bergen and Mortimer Snerd for tips on their act but mostly gets a bunch of misunderstandings from Mortimer. After trying to decide if Fozzie is everyone's favorite semi-funny man or semi-favorite funny man, Kermit brings on Fozzie Bear and Friend. Fozzie tries to tell a joke with Chuckie but is unaware that the ventriloquist is the one who makes the dummy talk. The act (and Chuckie) quickly falls apart from there. FOZZIE: He won't talk to me! KERMIT: Yeah, well listen, there's something about ventriloquism that I think you should know... (Whispers) It's the ventriloquist who actually does the talking. FOZZIE: Really??? No moving lips? 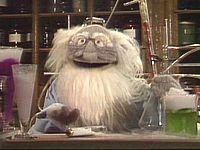 An elderly scientist sings as he mixes chemicals trying to come up with a fountain of youth formula. He initially succeeds but discovers one can only turn back the clock so far. Not just content with being singers and getting their own coop outside, the chickens return to the stage hen-pecking out notes on a piano. STATLER: Awful, I hated it. Kermit is thrilled to be bringing on Edgar Bergen and Charlie McCarthy (in their first "on-stage" act). The true ventriloquist and his dummy discuss the Muppet cast and meet Miss Piggy who doesn't take too well to Charlie's biting humor. Charlie will only come out for his curtain call provided that the pig is gone. WALDORF: (alone) He shouldn't have jumped. The show's not that bad.